Blog 2014 - Review a history of US foreign policy: ProQuest content that reveals "disagreement, debate and discussion"
The theme of the 2014 Annual Meeting of the American Historical Association is “Disagreement, Debate, Discussion.” In honor of this meeting, we decided to take a look at some ProQuest content that pertains to disagreement, debate, or discussion, with a focus on U.S. foreign policy. 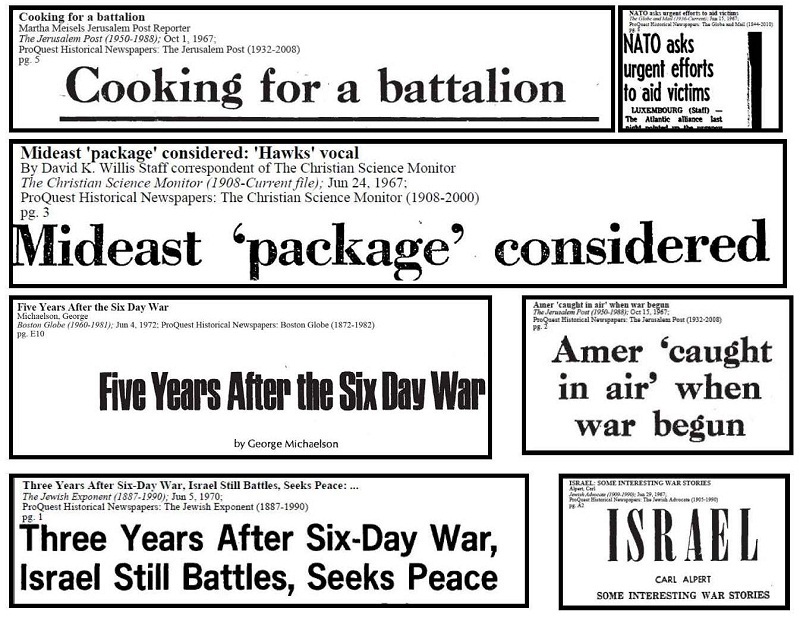 Searching on “1967 Israel War” or “Six Day War” brings up thousands of results in these newspapers, representing diverse perspectives on the war, from the political and military situation, to how the war affected the lives of individual people in the region, to the long-term implications of the war. ProQuest History Vault also offers documentation on the 1967 Six Day War from the perspective of the U.S. State Department. These records come from the U.S. State Department Office of the Executive Secretariat, Crisis Files, Middle East Crisis, 1967, part of History Vault’s Vietnam War and American Foreign Policy, 1960-1975 module. Cables sent and received by U.S. diplomats and embassy personnel compose the bulk of the materials in this collection, but there are also memoranda from high-level government officials; minutes of meetings and telephone conversations between U.S. and foreign leaders; personal correspondence; transcripts or summaries of speeches, press conferences, and interviews. Three years after the Six Day War, in a June 1970 memorandum from then National Security Adviser Henry Kissinger to President Richard M. Nixon, Kissinger wrote that the Middle East was the most dangerous foreign policy issue facing the administration, even more dangerous than the war in Vietnam. In October 1973, Israel, Egypt, and Syria would fight another war, the Yom Kippur War. The Richard M. Nixon National Security Files in History Vault’s Vietnam War and American Foreign Policy, 1960-1975 module documents the twists and turns in the Arab-Israeli conflict between 1969 and 1974, including a series of diplomatic initiatives that attempted to bring peace to the region. Among the issues covered in these talks were Israeli withdrawal from the territories occupied in 1967; Israeli use of the Suez Canal; freedom of navigation for Egyptian vessels in the Strait of Tiran; and recognition by Egypt, Israel, and Syria of each other’s sovereignty. Ultimately, despite meetings in New York, Washington, Tel Aviv, Moscow, and Cairo, none of these talks were able to reach a settlement that was acceptable to Israel or Egypt. Not only did the historic problems of the Arab-Israeli conflict prove unsolvable at that time, Cold War tensions further complicated the discussions, with the Soviets supporting Egypt and the Arabs, while the U.S. supported Israel.